NIA-CHARLESTOWN NEVIS (January 27, 2011) – Minister responsible for Information Technology in the Nevis Island Administration (NIA) Hon. Henley Daniel said Thursday that the computers bound for secondary school students on Nevis shortly from the Federal Government’s I Literacy Initiative, will represent a critical component in modern education for the Nevis Government. The Minister made the comment when he appeared in a briefing with Federal Minister responsible for Information and Technology in St. Kitts Hon. Glen Phillip and Attorney General and Minister of Legal Affairs Hon. Patrice Nisbett. 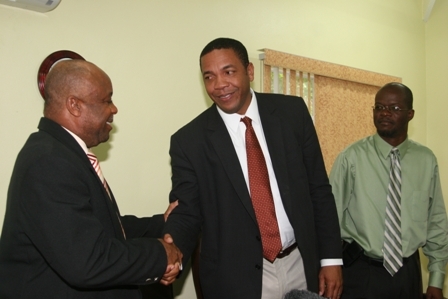 The briefing was held to account for the delay in the delivery of the personal computers which were initially scheduled for distribution to Nevis students by January 16, 2011. The briefing was held at the Ministry of Finance Conference Room in Charlestown. “I believe it could give the students in Nevis and St. Kitts a comparative advantage and a competitive advantage in terms of being able to succeed in education. Also it helps to bridge the digital divide and if we recognise, and I am sure we do, that we are in an information age then access to timely information is critical,” he said. The Minister said he was uncertain whether some parents recognised the vast difference the computer programme would make in the lives of their students, many of whom were already required to research work on the internet. A new personal computer, he noted, would make life easier for both parent and student. Mr. Daniel was also of the view that the programme would be a lifelong learning tool for the students that would help to get them unto and stay on the information revolution. He said the programme would also enable the NIA to work with the Federal Government and also to become competitive in an international environment. He pointed to the types of jobs that were available on the existing job market on Nevis and said the computer programme would also prepare the students for the technological age. “If we look at the emerging jobs in the country we see for instance that jobs are emerging in call centres where people are required to use computers on a regular basis. If these computers are provided to our high school students, I am certain that we will be in a better position to be able to (a) to access information and (b) to be better prepared to respond to the world of work. “As you are aware we have a Call Centre in Nevis with close to 200 persons working and at the moment they are expanding and we cannot expand the capacity while at the same time stay behind without computer information and computer access. So this computer programme will help us to respond appropriately,” he said. 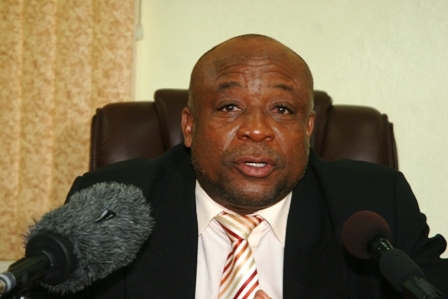 Notwithstanding, the Deputy Premier used the opportunity to urge students to continue to excel and to utilise the computers when they were delivered, for their personal and educational development. He said the new computers would help to redirect the energies of the students and so doing they would be left with less time to get involved in anti social behaviour. “This computer is to facilitate learning and I think the parents in Nevis would want to give the government as many kudos as possible and as many commendations as possible for being able to work along with the Federal Government to secure these computers for all of the children in high school. “We believe that these computers will sharpen the focus on education and ensure we have students who are always on the cutting edge. We believe that if you sharpen the focus on education, you reduce the incidents of anti social behaviour and if they can use these computers to do their homework and all other studies, then less time is available to do the things that are not so good,” he contended. However, the Minister also told parents their assistance would be necessary as they would be required to monitor their children and to help them care for the computers. He said they were a costly venture and too often the assumption was gifts of that nature were free. “They are not free. They cost a lot of money but we are making them available to the students free of cost but it cost and so I would urge the parents to help the students to make the best use of the computers,” he said. He told the students that on receipt of the computers they would own the most important gadget of the 21st Century and therefore an improved performance at both High Schools was expected. “With these computers we expect improved performance in High School because in our culture, in the new thinking in Nevis, performance not only matters, performance is what matters. “The Nevis Island Administration working in tandem with the Federal Government is pleased to make these computers available to the students but we say that the students have a responsibility because to whom much is given much is expected. So the students and the parents have a responsibility to ensure improved performance in High School and to ensure that the children benefit immensely from having access to modern technology,” he said. The computers which had been earmarked for delivery to students on Nevis on January 15th had been delayed due to a technical setback experienced by Microsoft and Hewlett Packard. The Federal Government had partnered with the computer companies to develop and produce the personal computers. A new delivery date is expected to be announced following a press conference with representatives from both companies slated for January 28th and 30th 2011 in St. Kitts.